6 - head of Holstein Milk Cows - consisting of 2 cows with calves on side, one cow fresh eight weeks ago, 3 cows to freshen by day of sale or shortly after. These are extra good milkers. TB and Bangs tested. One sow and four summer pigs. Deere corn planter with 130 rods of wire; Hayes corn planter with 130 rods of wire; manure spreader; John Deere endgate see-wheel wagon with hayrack; 5 1/2 ft. McCormick mower; Hoosier; John Deere elevator with jack and horse power; bobsled; iron grain drill; John Deere triple box wagon; rubber tire trailer; 3-section John Deere drag; 3 h.p. electric motor; grapple hay fork with 130 ft. rope; Jamesway brooder stove; oil burning tank heater; hand corn shelter; 3 burner oil stove with oven; many other small articles. Terms - cash: No property to be removed until settled for. Settlement to be made on day of sale. Not responsible in case of accident. Mrs. Donald M. Cobb sang accompanied by Mrs. Richard Schilling at the organ. Pallbearers were Floyd Adams, Harry Hussong, Earl Weber, Sam Hoerler, Harold Wheelock and Charles Withrow. Those in charge of flowers were Mr. and Mrs. Kenneth Petersen, Miss Helen Husson and Mrs. Harold Wheelock. Burial was in Erie Cemetery. Mrs. Edina Seger served lunch in her home after the funeral to the family and relatives. She was assisted in serving by Mrs. Francis Seger. Mrs. Charles Withrow and Mrs. Lyle Cole. ERIE - Botvid J. Jensen, 77, died suddenly in his home in Erie Monday afternoon. His daughter, Mrs. Harley Richards found him dead when she went to his home to take him to Prophetstown to spend the night in her home. The body was removed to the Schilling Funeral Home where friends may call late Wednesday afternoon and until the hour of services. Funeral services will be conducted in the methodist Church Friday at 2 p.m. the Rev. Donald M. Cobb, pastor, officiating. Burial will be in the Erie cemetery. Mr. Jensen was born Oct. 30, 1883, in Bornholm, Denmark. He came to the United States 64 years ago. 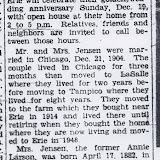 He was married to Annie Larson [sic] in Chicago in 1903. They lived in Chicago for three months following their marriage and then moved to LaSalle, where they resided for two years. They moved to Tampico from LaSalle and stayed there eight years following which time they purchased a farm near Erie in 1914. They engaged in farming until 1948 when they retired and moved into Erie to make their home. Mrs. Jensen died March 20, 1957. He was member of the Erie Methodist Church. Survivors are two daughters, Mrs. John (Elizabeth) Royer, Rock Falls; mrs. Harley (Esther) Richards, Prophetstown; two sons John, Deerfield; Harold, Port Byron; six grandsons, six granddaughters, several great-grandchildren; one brother, August Jensen, Tampico. ERIE - Mrs. Botvid Jensen, 74, died at 6:15 p.m. Wednesday at the Morrison Community Hospital where she had been a patient since March 9. The body was taken to the Schilling Funeral Home where friends may call. Funeral services will be conducted Friday at 2p.m. at the Erie Methodist Church, the Rev. Donald M. Cobb, pastor, officiating. Burial will be in the Erie Cemetery. Annie Elizabeth Larsen was born April 17, 1882 at Bornholm, Denmark, the daughter of Mr. and Mrs. Hans Larsen, youngest of nine children. She came to the United States in 1903 where she lived with a brother in LaSalle, later going to Chicago where she was employed. She was married to Botvid Jensen on Dec. 21, 1904 in Chicago. She had lived in Erie for the past 43 years. She was a member of the Erie Methodist Church, the Friendly Circle of the church and the Royal Neighbors of America. Survivors are two daughters, Mrs. John (Elizabeth) Royer, Rock Falls; Mrs. Harley (Esther) Richards, Prophetstown; two sons, John A. Jensen, Deerfield; Harold D. Jensen, Port Byron; 12 grandchildren; seven great-grandchildren; one brother, John A.J. Larsen, Litchville, S. D.
ERIE - Funeral services for Mrs. Botvid Jensen, 74, were held at the Erie Methodist Church Friday afternoon. Mrs. Jensen died at Morrison Community Hospital Wednesday at 6:15 p.m. The Rev. Donald M. Cobb, pastor officiated. Mrs. Donald M. Cobb sang "In The Garden" and "Beautiful Isle of Somewhere." Mrs. George Hoerler was organist. Pallbearers were Clair Pickens, Morrison; Harry Husson, Earl Weber, Sam Hoerler, Harold Wheelock and Clay Cox. Those in charge of flowers were Mr. and Mrs. Jack James and Mr. and Mrs. Kenneth Petersen. Burial was in Erie Cemetery. The Woman's Society of Christian Service of the Methodist Church served dinner to the family and relatives before the funeral in the church dining room and they also served refreshments to the family and relatives after the funeral in the church basement. Relatives who attended the funeral from out of town were from Deerfield, Prophetstown, Port Byron, Rock Falls, Morrison, Moline, Tampico, Rochelle, Wateman, Lyndon. Miss Patricia Ann Jensen, Hays, Kan. and Kenneth Weimer, Hillsdale, exchanged vows at four o'clock on June 20, in the Lutheran Church at hays, Kan.
Parents of the couple are Mr. and Mrs. Harold C. Jensen of zhays and mrs. Kenneth Weimer of Hillsdale and the late Kenneth Weimer. The double ring ceremony was officiated by the Rev. Earl Wall. Miss Margaret Vesecky and Miss May Hughes sang "O Promise Me," and Miss Carolyn Gassner and Mrs. Wayne Archer played "The Lord's Prayer." The altar was adorned with Yellow gladioli and green carnations. The bride was escorted to the altar by her father. She wore a one piece A-line style organza and Chantilly lace gown, fashioned with lace bishop sleeves and high scoop neckline trimmed in pearls. Train of lace panels was attached to neckline. Her elbow length veil of nylon illusion was held in place by a pearl and Chantilly spring headpiece. She carried a bridal bouquet of yellow roses with an orchid in the center. Her only jewelry was a gold locket which her mother had worn on her wedding day, a gift from her father. Miss Kay Jensen served her sister as maid of honor and Miss Christine Weimer, sister of the bridegroom as bridesmaid. Candle lighters were Miss Debra Byerley cousin of the bride and Miss Merry Weimer, sister of the bridegroom. The maid of honor and bridesmaid wore green gowns and carried bouquets of yellow carnations. Tom Jensen, brother of the bride, was best man, Rowland Byerly, uncle of the bride, was groomsman. ushers were Ray Jensen, brother of the bride and Jerry and Mark Weimer, brothers of the bridegroom. Christine and Michael Byerley, cousins of the bride, were flower girl and ring bearer. The bride;s mother wore a beige lace dress with bronze accessories and an orchid corsage. The bridegroom's mother chose a blue dress with white accessories for her son's wedding, accented with an orchid corsage. Mrs. Rowland Byerley and Miss Patty Ann Weimer were in charge of the gifts at the reception following the ceremony in the church social rooms.The couple will be at home at 7715 Shore Dr., Apt. 203 in Chicago, where the bridegroom is stationed with the army. The bride graduated from nurses' training school in Kansas in May. The bridegroom is a gradate of Erie High School and is serving with the U. S. Army. Born, a daughter, to Mr. and mrs. Harold Jensen of Fulton, at the Lutheran hospital in Moline, Sunday morning. The baby has been named Patricia Ann. Mr. and mrs. Jensen are former Erie residents. Mrs. Jensen was formerly Miss Harriet Morgan. Born, a son, to Mr. and Mrs. Harold Jensen of Erie, Saturday at the Moline public hospital. Mrs. Jensen is the former Miss Harriet Morgan of Erie. The marriage of Miss Harriet Morgan, daughter of Mr. and Mrs. Frank Morgan of Erie to Harold Jensen, son of Mr. and Mrs. Botvid Jensen of Erie, was solemnized at 1;30 o'clock Saturday at the First Christian church of Davenport. Rev. F. I. Stevens of Port Byron, uncle of the bride, was the officiating clergyman. Mrs. Frank Morgan and Mrs. F. I. Stevens were in attendance at the ceremony. The bride graduated from the Port Byron high school with the class of 1931. She attended Northwestern university for a time and graduated in 1935 from Knox college. She was member of the Delta Zeta sorority. For the last three years she has taught in rural schools near Erie. Mr. Jensen is a graduate of the Hillsdale high school , class of 1932, and attended the state teachers college in DeKalb. He is now employed by the Standard Oil company. They will make their home in Erie and Mrs. Jensen will continue her teaching at the East Sandridge school. Click on photo to "open" album to see other pictures or to enlarge.